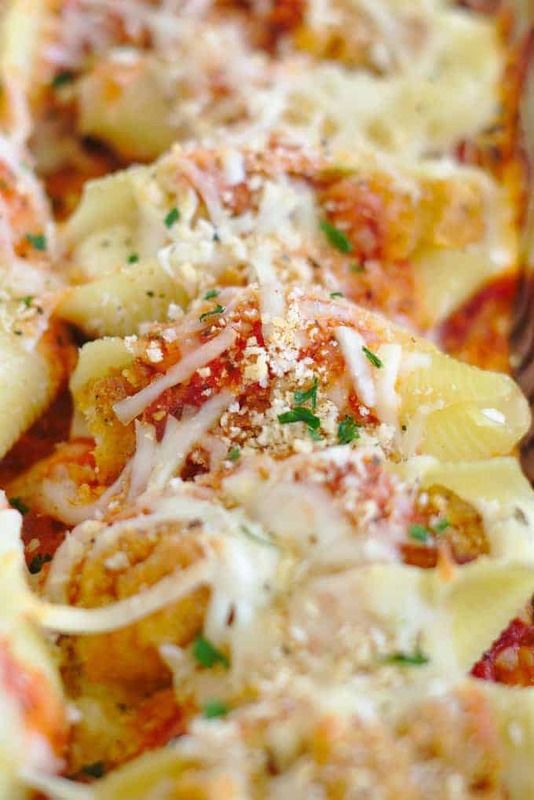 Chicken Parmesan Stuffed Shells – Delicious stuffed shell pasta filled with cheese and crispy chicken, topped with marinara sauce and more cheese! Chicken parmesan stuffed shells are an easy and delicious weeknight meal that is sure to be a new family favorite! Stuffed shell pasta has always been a favorite meal of mine. Making them on Christmas Eve was a tradition at my house that I absolutely loved every year! 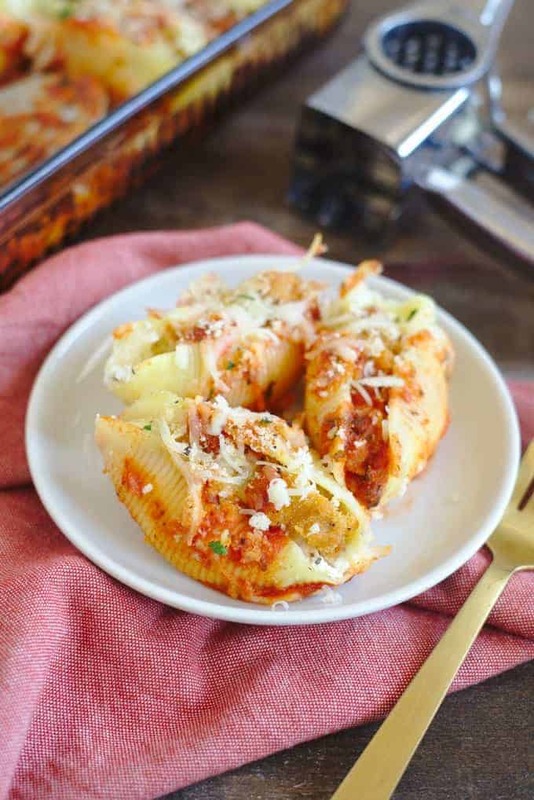 These chicken parmesan stuffed shells are my spin on a combination of two of my absolute favorite meals – those amazing stuffed shells I had growing up and of course, chicken parmesan! Now these stuffed shells are so much easier to make than they look. It’s an easy meal that feeds a crowd and takes less than 40 minutes. Crazy, right? I highly suggest serving these stuffed shells with some garlic bread. For me, pasta just isn’t complete unless I can be dipping some crunchy bread in the pasta sauce. The combination of flavors is so perfect together too! 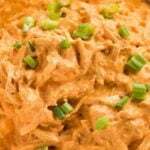 If you love this recipe, then check out my Chicken Parmesan Dip over at my site Mildly Meandering! What is a stuffed shell? 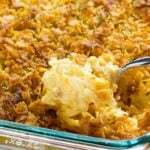 It’s a jumbo shell pasta filled with delicious filling such as cheese and meat before being baked. I did actually have to explain it to my friend who was over for dinner because he hadn’t heard of them before! Using breaded chicken tenders really takes them to the next step but that is totally optional. 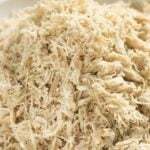 If you want to cut out a bit of the carbs, you can use plain chicken breasts instead. Make sure you give the jumbo shell pasta a bit of time to cool before stuffing them with filling. I’ll admit, I got a bit excited about making dinner and I didn’t wait for them to cool and was playing hot potato with the noodles each time I picked them up because they were so hot! Be careful! Spooning in the filling to the shells is easy but another way is to put the filling in a ziploc bag, cut of the end, and pipe it into each shell. I used a 9″x13″ baking dish for the stuffed shells. Make sure you do use a dish with a rim, you don’t want the marinara sauce overflowing out of the dish. 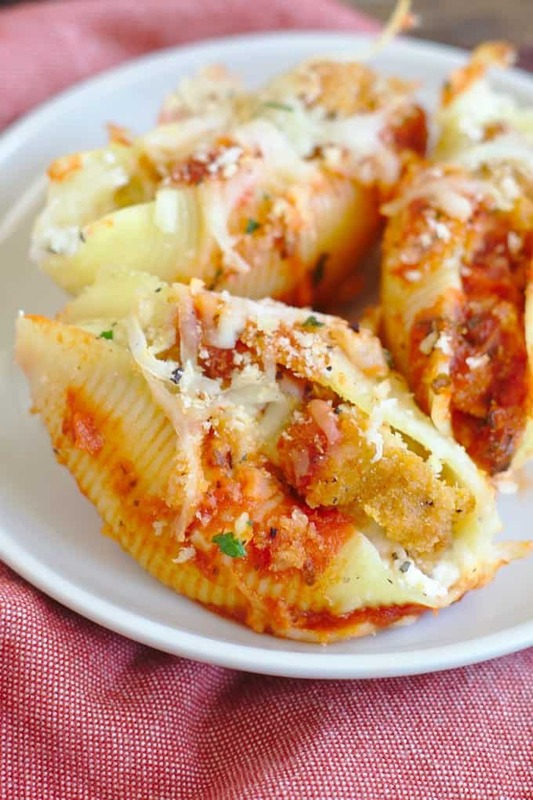 Chicken Parmesan Stuffed Shells - Delicious stuffed shell pasta filled with cheese and crispy chicken, topped with marinara sauce and more cheese! 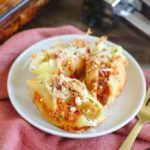 Chicken parmesan stuffed shells are an easy and delicious weeknight meal that is sure to be a new family favorite! Cook chicken tenders and jumbo shell pasta according to instructions on the packaging. Make sure to drain pasta and well and let cool a bit before proceeding. Cut chicken tenders into chunks that are about 1/2 inch cubes. Preheat oven to 400 degrees. 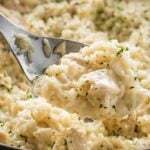 In a medium mixing bowl, combine ricotta, half of the mozzarella, parmesan, garlic powder, italian seasoning, salt, and pepper. Stir until well combined. Cover the bottom of a large baking dish with half of the marinara sauce. Spread it evenly around. Spoon about 1 1/2 tablespoon of ricotta filling into each of the shells before placing 2 chunks of chicken on top of the filling. Place face up in the baking dish. Repeat with remaining shells. 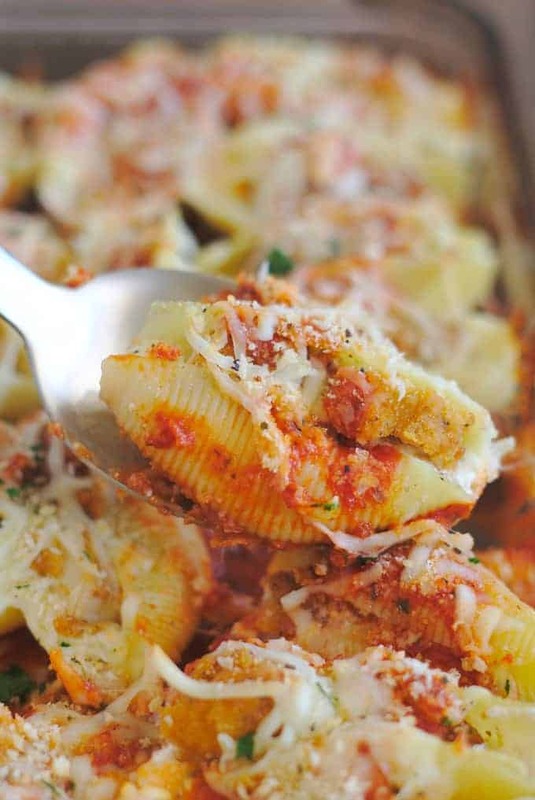 Cover the shells with the remaining marinara and sprinkle remaining mozzarella cheese and bread crumbs on top. 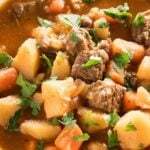 Place in oven and bake 20-22 minutes. Could this be made, then frozen for another night? Looks yummy!!!! This looks really good! Stuffed shells are favorite in our house! My family will love these stuffed shells! Such a fun twist on a classic Parm! Super-fabulous idea! I love these and can’t wait to give them a try! My husband would love, LOVE this!! It looks and sounds absolutely delicious!!! What a delicious meal this looks like!! I love that crispy chicken inside! This looks so delicious! Perfect dinner for any night of the week! I don’t know why I’ve never thought to try this before! 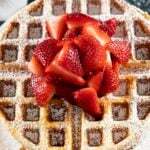 What a creative, easy, and delicious recipe idea! These look so yummy! I’ve never made stuffed shells at home but will have to try this with dairy-free cheese. 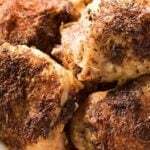 What a great family dinner recipe! These are calling my name! I love them! Stuffed shells and garlic bread sounds absolutely divine! My mouth waters at the sight of these! This looks absolutely delicious and perfect for a weeknight meal. The stuffing looks easy to do too, saving to try soon.